Caio de Almeida Cunha of the Sao Paulo language school, 4AllBrazil, visited Papplewick on Friday 24th October to exchange ideas for the design of a new classroom suite they are building in Sao Paulo. 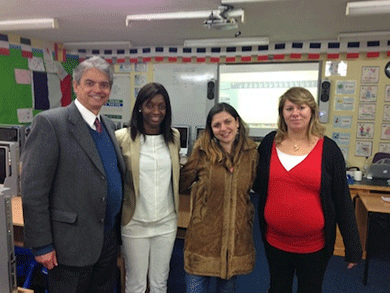 Mr de Ameida Cunha and Ms Sarita Andrea, 4AllBrazil’s language lab coordinator, observed some lessons in the language lab and met up with teachers from Papplewick. Since 2009, the Papplewick Modern Languages Department has been using the Schoolshape Language Laboratory to encourage boys to practise their French skills. Using the lab, Maimouna Cissé, Head of MFL, and teachers Laetitia Langue and Jeremy Ward use the IT Tool to differentiate language tasks for all learners, thus ensuring that each pupil has personal attention, learns at the right level and at his own pace. 4AllBrazil hope that their initiative will be a shining example of language education for the Brazilian people, who urgently need to learn foreign languages in order to trade abroad and boost their economy. Caio Cunha, director of 4AllBrazill, said of their visit: “It was really fantastic to see your experience in class using Schoolshape. You really gave us an excellent view of Schoolshape in full use. We expect to replicate something very similar in Brazil. Congratulations for the beautiful school and classes you lead. We look forward to maintaining further contact to exchange experiences in language learning as well as Schoolshape solutions”. Last week representatives of 4All Brazil, a language school based in Sao Paulo, flew to the UK Channel Island of Jersey to meet the directors of Schoolshape Limited to discuss the distribution of Schoolshape’s language learning software to educational institutions across Brazil. There is an urgent need for the populations of developing countries to learn foreign languages such as English. With the cloud-based lab, users can work on computers already installed in schools or on their own devices at home. Teachers can organise, differentiate, record and monitor their students’ work in all four language skills. Language schools can use the system very effectively on a large scale, and thus play an important role in boosting their national economy. In 2011 the director of 4All Brazil saw the advantages of using an online system to teach English to adults in Sao Paulo. Over the last 3 years, the company has used the software developed by Schoolshape so successfully that they are looking to expand their operations. The number of recordings of speaking tests submitted online through the Schoolshape system has increased dramatically from 165 in May 2009 to 2504 in May 2014. In May 2014, 2504 recordings were sent from 88 prep schools to 138 senior schools - a total of 256 hours of audio. Average length of recordings was 6 mins 8 seconds, with the longest recording 12 mins 55 seconds. For further information about Schoolshape Online Examinations, or the Schoolshape Online Language Lab, please contact info@schoolshape.com. The new login screen forms is fundamental our current developments which will allow Schoolshape to run on tablets and smartphones. an technologically up-to-date interface, eventually allowing access from any computer or hand-held device. a future-proof system for allowing secure, structured interaction between language laboratory/exchange partners worldwide. You can still log in with your school name, your name and password. This works as before, except faster! Students and teachers can now log in using their Google Apps For Education, Google Plus, Twitter or Facebook accounts. The advantage to this is that users do not need to remember their Schoolshape password. If your school network disallows external social networking, this login method will not function. To link a social network account, click &#39;Admin&#39;->&#39;My Settings&#39;->‘Login Accounts’. Those running a custom language lab will still be using the old login screen by default, but can access the new one at <your domain>/authenticate. The 12% of you using Internet Explorer versions 8 and 9 will also still see the old login screen, but we encourage you to upgrade to Internet Explorer 10 or 11 as soon as you can, both for your own security and because we will be dropping support for these old browsers in the new year. Please let us know if you would like to have additional methods of logging in, for example using your Moodle or Edmodo accounts. Are you or your students fed up with having to remember different passwords for each site you use? If so, we have some good news for you. You can now forget about your Schoolshape password and log in using your Google, Twitter or Facebook accounts. It&#39;s also now possible for students to link their email accounts so they can recover their passwords when they are lost. http://lab.schoolshape.com/authenticate. This will become the default login page in the near future. If your students are frequently asking you to reset their passwords for them, you can tell them to link an account so they can recover their own passwords in future.